The awe-inspiring stories of prehistoric earth are unfolding at the Museum of Natural History with the arrival of Dinosaurs Unearthed – an immersive exhibition that features dynamic scenes of life-size, lifelike animatronic dinosaurs, full-scale skeletons and fossils from around the world. The experience presents two stirring tales of large-scale excavation sites from opposite sides of the globe and reveals secrets about life on earth, millions of years ago. Dinosaurs Unearthed inspires excitement with realistic animatronic dinosaurs while presenting visitors with the science behind their discoveries. 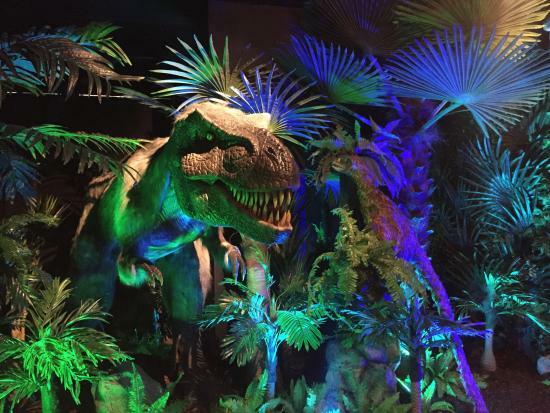 The exhibition showcases more than a dozen roaring, breathing animatronic dinosaurs alongside a collection of fossils from across the Jurassic and Cretaceous Periods and presents intriguing stories about dinosaur appearance and behavior. Dinosaurs Unearthed encourages guest participation with four interactive touch-and-learn stations and two interactive consoles where guests can control the movements of an animatronic dinosaur. The young and the young at heart can play paleontologist at the dig table, where fossil replicas wait to be unearthed and identified. The comprehensive display of science, technology and inspiration captures the human fascination with dinosaurs in an impressive exhibition. Custom-designed and handcrafted by paleo-artists especially for Dinosaurs Unearthed, each of the animatronic dinosaurs and fossil replicas present a clear representation of the best available knowledge from paleontologists. A team of science and design experts has ensured that the exhibition is both visually impressive and authentic to what scientists know about dinosaurs today. Dinosaurs Unearthed is opens in January 2019.